Here is a record that is dream inducing, melody-laden, golden, and crisp indie-pop with plenty of smarts, and chops to boot. 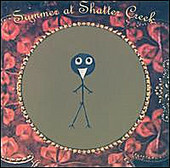 Summer At Shatter Creek's self-titled full-length paints an array of colors in the sky, pulls each one down, a few at a time, and builds warming, blanket-snuggling songs that nestle between you and your stereo and make you feel good about yourself. The plaintive portions of the album help push the optimism to the top. Sounding like the transition from winter to spring, Summer at Shatter Creek hold their indie flag high and do pop justice in the process, a tight-rope walking scenario that often ends badly, but not for Summer at Shatter Creek. I'll give this a B.